Impulse buying is something we’ve all done. Maybe it was a glossy magazine in the checkout line or a pair of shoes being offered at a price you “couldn’t pass up”. These small, irrelevant items that find their way into your shopping cart can add up quickly. Although impulse buying has dealt a fatal blow to many a household budget, the good news is yours doesn’t have to be next. Arming yourself with a few tips before you go out shopping can ensure you resist the urge to make these trivial (and costly) purchases for good. At the beginning of the month, start a log. Write down everything you spend for a full month. At the end of that month, review your trends to see how much you spent impulsively. 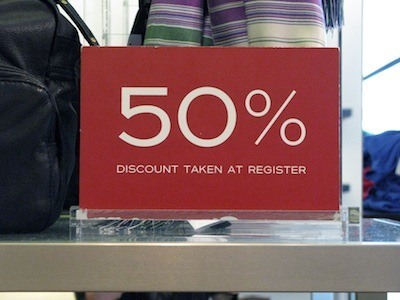 The results may startle you enough to kick start your anti-impulse buying campaign. Know what you need before shopping. This cuts down on time spent browsing, which is most often when the impulse to buy strikes. If you do need to purchase an item, seek out a coupon first. These days, you can find a coupon for almost any product, from any retailer online. Gone are the days of coupon clipping. For example, if you’re looking for Macy’s coupons, then simply go to your preferred search engine and type that in. You’ll get pages full of website that publish coupons and deals. 4. Learn to separate “needs” from “wants”. Make every attempt to justify your purchases based on a need instead of a want. Just because you want that leather jacket you saw on sale at the mall doesn’t mean you need it – especially with four others hanging in your closet. Friends, spouses and children can all be a hindrance on a budget-conscious shopper‘s mission. The urge to splurge gets stronger around certain influences – such as shopaholic friends and crying children. 6. Eat before going shopping. It sounds silly, but a lot of impulse shopping happens when people grocery shop on an empty stomach. Every thing is tempting, making shoppers more likely to buy pricier things than they would normally buy to satisfy a food craving. Some impulse buyers have a particular weakness. It might be cosmetics, clothing, DVDs or even books. Avoid these items. Don’t even shop at the same stores. Change your shopping routine completely to get out of this rut. Remind yourself that every impulsive purchase you resist is $X toward a vacation or other special treat, $X more dollars in your savings account or $X less dollars in debt. Some people wait all year for Black Friday when it’s possible to get the same kind of deals online. Cyber Monday is a holiday introduced a few years ago that allows online retailers to get in on the Black Friday madness. It’s also easier to comparison shop online as some merchants’ normal prices are considerably higher than others. If you find something that you think you truly cannot live without – sleep on it. Return to the store the next day. If the urge is still there and still as strong, you might consider making the purchase. If not, recite your mantra from #8 and give yourself a pat on the back. What tips do you have to curb impulse spending? I just started tracking all spending with evernote and my phone. I think having to write it down will pretty much destroy any impulse purchases. I think sleeping on it will curb just about any impulse spending you can think of. Nice tips! Going on the sleep theme, make sure you are well rested before making any major decisions. Sometimes I settle when I’m just too tired to shop around for a better deal. Coupons are available for everything. I still enjoy clipping coupons the old fashioned way to maximize my savings. If you had to estimate, what percentage of readers do you think will embrace these tips? I know they sound good to you in theory, but no one will practice them. Come on. If I’m addicted to DVDs, your suggestion is to avoid stores that sell them and “change your shopping routine completely to get out of this rut.” If someone has a “shopping routine”, they’re way past the point of needing intervention. Any data to back up your specious “empty stomach” claim? I’d think that if someone was contemplating buying a $200 dress, but was hungry, she’d rather take a timeout and spend a few bucks in the food court than immediately buy the dress. @ Greg – I do embrace these tips (although, not all at once). For example, you can create a shopping routine by deleting emails from retailers. While some retailers are inflating Cyber Monday as just fluff, I have also gotten great deals the last two years. I do work in front of a computer, so it’s easier to partake in the sales early & that allows me access to inventory before it’s sold-out. Regarding the eating before shopping – I’m generalizing here, but clearly you’re not a woman. This is a tip that I know of firsthand, through multiple friends and have read about in several magazines. Also, if the reason you’re hungry is because you’re trying to fit into dress, then shopping is a way to satiate that need. Not a great idea – but it happens. My big one is in line with #10 here: Patience! I think you need to wait a few days or even a week or 2 weeks before making a big purchase. Almost always for me I realize I can live without it or find a better deal or a better quality substitute for this purchase. There is almost NOTHING that you can’t wait at least a day to buy. I think this strategy will save anyone a ton of money and stress. #6 is my favorite, I have been doing that one for years and it works like a charm. Just today I went grocery shopping hungry and it was stressful because I had to keep talking myself out of all of the foods that I know are bad for me. First, calculate your “real net wage” per hour–for examply the amount of your bi-weekly paycheque divided by 10 (most of us get paid every two weeks for ten working days). Then, next time you are tempted to purchase something that is not a real need quickly calculate how many hours you will have to work to pay for it. Is that cool pair of shoes, even at half price, worth 2 days of your life? Works for me every time!